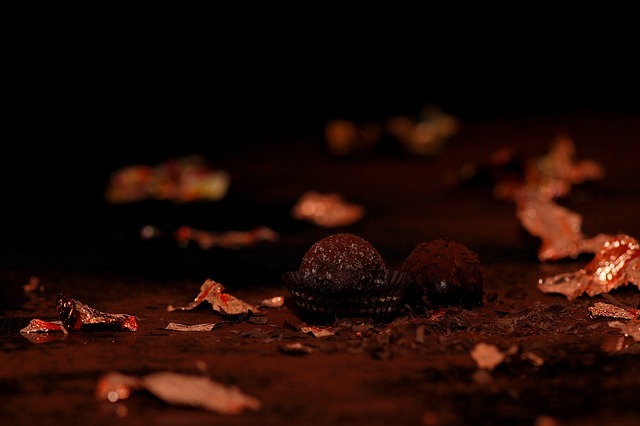 Chocolate was once a very rare food that is now made the common place as a sweet treat or candy. There are countless varieties of chocolate and chocolate based products available on the market for human consumption. While chocolate has been used for human consumption for centuries, it was not always available in the same form as it is today. Chocolate was originally used as a drink by the Aztecs and introduced to Spaniards during the process of colonization of South America through the 16th century. Chocolate was later made into a hard edible form by adding other ingredients to the powder and making it available for eating in the form of a bar. Today, chocolate is available as a flavor for almost anything, and is very popular around the world in all kinds of different ways, usually as a sweet treat or part of a dessert, and very popular in baking. Chocolate is made from the cacao beans of the cacao tree. In its natural form, the cacao bean can yield nibs, or be consumed as a whole bean, which is very bitter. In order to make chocolate, the bean is cultivated, dried and crushed into a power. Cacao powder can also be consumed in its raw form and is available on the market, or it can be used in order to make chocolate. The cacao tree (Theobroma cacao) requires a warm and sunny climate in order to grow and is mainly available in South America. It is very common in Ecuador and represents a large part of Ecuador’s exports worldwide.Cacao also grows in some parts of Africa and is widely exported from there as well. 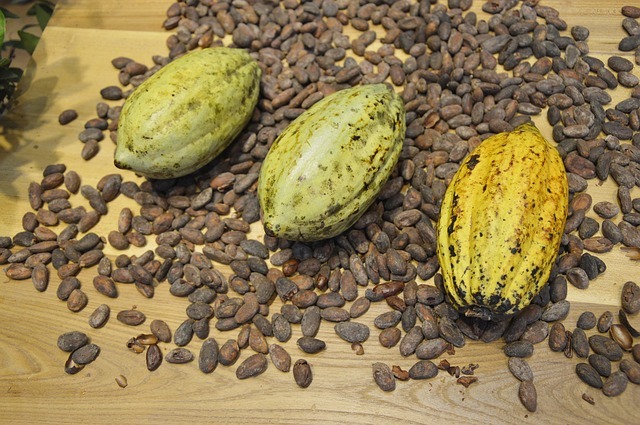 The cacao beans grow in pods that are the fruit of the tree and are then harvested, fermented, dried and roasted so that it can be transformed into a variety of different types of chocolate. While the tree, pods, beans, and nibs are generally referred to as ‘cacao’, once the beans are fermented, we typically will refer to them as ‘cocoa’ beans, or powder, to distinguish the fermented beans from the raw form. Harvesting cacao is a delicate art. The fruits must turn a vibrant yellow or red when they are ripe and be harvested at peak ripeness in order to yield the best quality of cacao. Once the pods are harvested, they are sliced open and the beans inside them are harvested. After fermentation, the beans turn a dark purple color, which is how they are usually made available on the market, whether as whole beans or in the form of nibs, which are the broken down parts of the bean. Fermenting cacao is a practice that dates back to over 3000 years ago when cacao beans were used to make cacao wine in Africa. 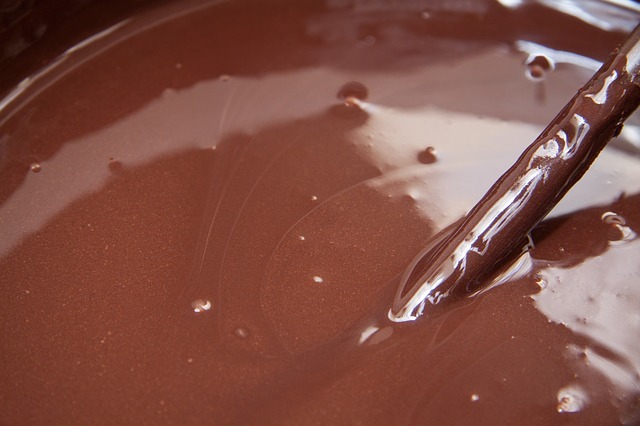 Currently, the fermentation is used in the process of making chocolate and other cacao-based chocolate products. The chocolate is covered with banana leaves and left to ferment 2-9 days until it is ready to be dried and then used for a variety of products on the market. In order to make varieties of chocolate, the cocoa must be made into ‘cocoa mass’. Cocoa mass or cocoa liquor is the fermented bean pulp that is solid at room temperature. Under high pressure, it can produce a cocoa powder or cocoa butter, which can be used to make any variety of chocolate. The chocolate itself is made by adding sweetener and other ingredients, such as milk, lecithin, butter, into the solid form. It can also contain fruits, nuts, seeds, flavors, and even be added as a coating to any candy, fruit, or other dishes.. We typically distinguish chocolate into main categories, which are milk chocolate, white chocolate, and dark chocolate. Chocolate is a very versatile product and the flavor varies according to the ingredients. As cow’s milk, sugar and other ingredients became a staple set of ingredients to add to chocolate, the different varieties of chocolate have been known according to the percentage of sugar, milk and cocoa powder. Dark chocolate is typically more bitter to taste than milk chocolate as it contains less added sugar and milk, and sometimes none. There are many varieties on the market now that are available sugar-free, or without dairy products, and can even be made raw. So it is a very versatile product that can accommodate people with concerns over diabetes and blood sugar intake and regulation, as well as concerns over-sensitivities to dairy and other ingredients. Not all chocolate available on the market is high quality, and depending on how it is made and processed, it can contain any number of ingredients, including allergens, so it is a good idea to always verify ingredients in any chocolate product if this is a source of concern. However, with these many products available on the market, unless someone is allergic to cacao there is typically some kind of chocolate available that can suit your needs. Rich, slow-melting dark chocolate, crafted from the highest quality ingredients. A full-bodied dark chocolate masterfully crafted to be smooth, rich and balanced. Chocolate is considered dark chocolate if it contains at least 70-80% cacao. 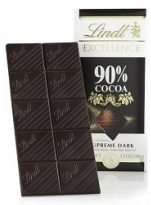 Anything more than 80% is possible, but rarer because the taste tends to be quite bitter as the amount of cacao increases, which makes it less palatable and therefore less popular. While dark chocolate typically contains less milk, it is still possible that it can contain some dairy products and even sugar, so even with dark chocolate that contains a high percentage of cacao, it is always a good idea to check the ingredients to be sure that the contents of the chocolate are all ingredients that can be consumed safely. Nutritional information can vary for dark chocolate as much as the ingredients do, so nutritional information is always somewhat variable, and it is a good idea to check the nutritional value of a chocolate product as well as the ingredients before consumption, especially if considering adding dark chocolate to your diet for daily intake in order to get some of the health benefits of this food. Fortunately, since the health benefits of dark chocolate are present in the cacao bean itself, regardless of other ingredients, many of those benefits are still available as all the nutrients and vitamins and other contents are inherent in the cacao bean and derived products such as chocolate. However, some of those benefits can be negated by the presence of unhealthy ingredients when consumed regularly, such as chocolate that is high in sugar or other artificial sweeteners, for instance. Dark chocolate is high-energy food and contains on average 170 calories per ounce. This is a high calorie intake, which is why it is important to be conscientious with portion sizing, especially in the case of daily intake or even regular consumption. Chocolate is a source of essential nutrients such as iron, magnesium, copper and manganese. While many of these minerals are not required in large amounts, it is important for the body to be able to access small amounts of food in order to benefit the bones, muscles and connective tissues of the body. Dark chocolate is also a rich source of antioxidants, which have been heralded as cancer preventing food. 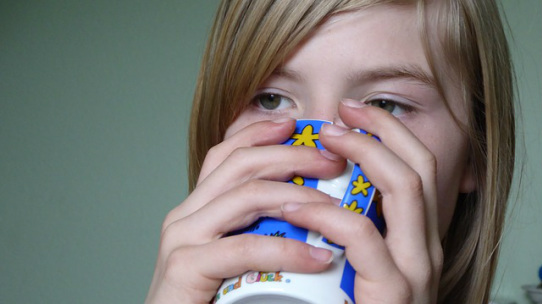 It is also a source of caffeine and theobromine, two stimulants that keep the nervous system alert and healthy when not consumed in excessive amounts. The amounts of fat and sugar can vary in dark chocolate as well, due to the ingredients it may contain and how it is processed, but dark chocolate is generally not high in saturated fats or cholesterol and very low in sodium unless it is a variety where salt is added for flavor. Dark chocolate is high in potassium, calcium and surprisingly high in protein, containing up to 2.2g per ounce. While it cannot be considered a regular primary source of protein, adding it into your diet does contribute to the overall amount of protein intake and energizes the body. Dark chocolate has been associated with many health benefits, including improving the circulatory system and protecting against heart disease (study). While there is some debate on this particular health benefit due to chocolate’s effect on blood glucose levels, it is nonetheless generally agreed upon that an appropriate daily intake of dark chocolate can help improve arterial function (study), and some studies show the improvement in platelets and endothelial function. Other studies show that insulin sensitivity is increased in those with hypersensitivity, and that blood pressure is reduced when consuming dark chocolate for 15 consecutive days, which suggests that a small amount of regular consumption on a daily basis can yield significant results in a regularly short period of time. 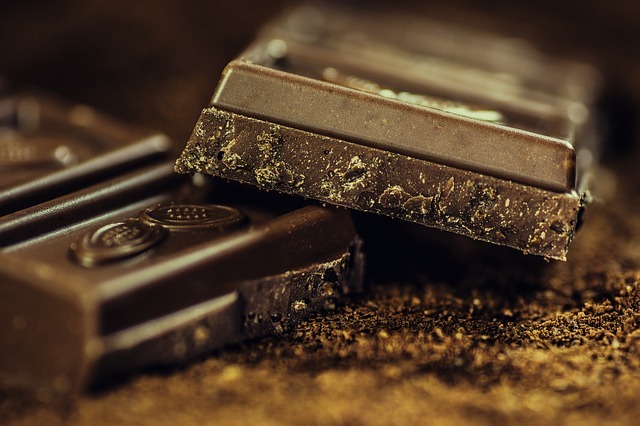 Dark chocolate can assist individuals in reducing food cravings, as demonstrated in some experiments, and has also been shown (study) to protect the skin against harmful UV rays and is therefore beneficial for skin health. In the latter case, the effects measured in studies have been observed over a 12 week period and are suspected to require a longer regular intake of chocolate in order to yield positive results. For those suffering from UV-related skin conditions such as UV-erythema, this is a very promising aspect of daily intake of dark chocolate, as studies have shown that dark chocolate was a contributing factor in reducing roughness and irritation of the skin, as well as scaling. Another less well-known health benefit of dark chocolate is its impact on stress reduction, which was demonstrated in a study that found regular consumption of dark chocolate. As compared with equal consumption of milk chocolate and white chocolate, those who consumed dark chocolate scored lower on the stress scales than those who had been ingesting white chocolate or milk chocolate. Due to its contents of antioxidants, polyphenol, and flavonoids, dark chocolate meets the definition of what is considered to be a superfood or super fruit, and when looking at this long list of health benefits gained from regular ingestion, that is not surprising at all. But what is the right portion for daily intake of dark chocolate? In clinical studies, the range of what is considered an appropriate daily intake to get the most health benefits would be between 20-40g and must be maintained over at least a 2 week period to start seeing benefits, and up to 12 weeks in the case of UV resistance in the skin. It is important to keep in mind when selecting a daily intake amount, that sugar is part of that daily intake and to stay within any prescribed maximum amount.In the case of uncertainty, it is always advisable to start with a smaller amount, such as 20g and then build up to a larger amount such as 30-40g over time. One of the biggest considerations with chocolate is the sugar content. Most chocolate available on the market is high in sugar and can contain up to 24 grams of sugar per ounce of chocolate, which is considered a very high amount. This can be a problem for anyone suffering from diabetes or high blood pressure, or at risk for those conditions. Sugar and artificial sweeteners are generally not recommended for daily intake and have been linked to many inflammatory health conditions, and can also aggravate candida overgrowth, yeast infections, and even fungal infections and should be avoided for anyone suffering from or at risk for any of those conditions. The safest way to consume chocolate is to seek varieties that are low in sugar or sugar-free and limit or avoid the high-sugar varieties. Another important consideration with chocolate as it is available on the market is the amount of contact it may have with common allergens or contents of such allergens in the ingredients themselves. Common allergens include nuts, seeds, wheat and gluten, corn and dairy products. For someone who has an allergy to these products or who believes they may have a sensitivity, it is important to verify the ingredients of the chocolate product, and in the case of a severe sensitivity or life-threatening allergy, one should also ensure that the processing facility was clear from any of these allergens, as well as the distribution process. Corn Oil vs Vegetable Oil – What’s the difference and which one is better?